I’m a big fan of Campaign Monitor for managing email lists and campaigns. I recently set up a list for a friend, and I agreed to put a small subscription form in his sidebar at the side of his WordPress site, but also have a dedicated page for people to visit to sign up – so that he could share the link to the page on Twitter, Facebook etc. Now, Campaign Monitor make it pretty easy to create a sign-up form, but by default the form will take you off your original site, onto a Campaign Monitor “Thank you for subscribing” page. I wanted to see if I could improve on that a little, so, having worked with the Campaign Monitor API before for a Joomla! / Campaign monitor integration I sat down to see what we could do. The result is the Ajax Campaign Monitor Forms plugin for WordPress. The result is a mini-form in your sidebar, that submits the request via Ajax without the user leaving your site. If you like the free plugin, then you’ll love the Premium version, including list stats in your WordPress dashboard, spam protection, and automated social media links. Check it out today. This is really nice. Translation is very important. Here are the two places I would like to see it. In the Greet Box WordPress plugin. Especially with a mobile version of WordPress. And in the pop-up over plugin from WPMUDEV. Can the plugin be expanded to multiple lists? If so, can it (at the webmaster’s option) display a check-box for each list? Can the plugin be improved to allow a custom confirmation message? News of the WordPress plugin is very timely for me, because I’m now working to add a newsletter option to my website, which is accessed mostly in Japan, and therefore is bilingual. 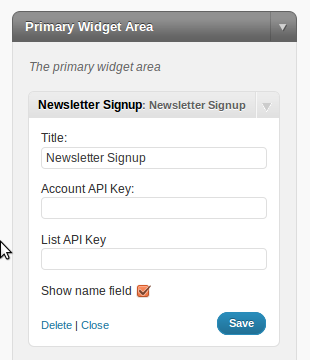 I’d like to know if the widget can be set up so that “Country” can be seen in the signup box, along with Name and Email. Hi – the plugin doesn’t currently support custom fields I’m afraid. Do you know any way to fix this? 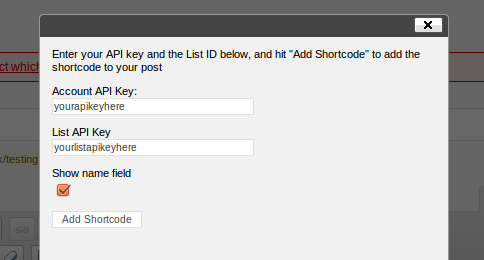 – Detailed steps of how you’ve configured the plugin and/or a login to your WordPress dashboard. Would you be able to ‘score’ a Google Analytics goal using this form? That’s one benefit of having the url redirect on submission, that you can use GA to monitor/track how many times a form has been completed by setting the redirect url as a goal. Update: IE8, Safari 5.0.3 and Firefox 3.6.8 only display the short code [cm_ajax_subscribe id=1]. Chrome displays the HTML Form. Yea, this one is strange because I understand that and can’t see any reason why a choice of browser would make any difference either. Cool plugin.. haven’t actually installed this yet but I know I will get a lot of use out of this plugin as I add Campaign Monitor sign up forms to nearly every website I do and I hate the Contact Form 7 plugin. Is there a way to add this to my templates with a template tag? I don’t tend to use widgets. You can then add it to your template using the do_shortcode() function. e.g. I’m attempting to do as you describe here, but can’t quite get it to work. Unfortunately, when I add to my footer.php file, nothing shows up. Am I missing an obvious step here? Anyway, thanks for the plugin. I’m excited to get it working because it’s a HUGE improvement over what I had there. Ah – yes. I did mean to use an underscore. and it didn’t show up. That said, it could be that my theme (which is one I customized by modifying TwentyTen) is somehow causing the problem. In case it’s not obvious by now, I’m not an expert in this stuff, but trying to learn. I will send you login details, and I GREATLY appreciate your time. Thanks! I have been tinkering with it to try to make the form disappear when the subscription is successful and only display the success_style. What would be the best way to do this. You didn’t say whether you’re using a widget – or a shortcode. I’ve assumed widget below – the changes will be similar for a shortcode – just in a different file! Thanks for your quick response, i added something to the code you posted so it would still display the successful subscription text. Great idea, but I’m getting the following error message: “Sorry, we weren’t able to sign you up. Please check your details, and try again.” I’m on hostgator running PHP 5.2 so I don’t think that’s the problem. Any help would be greatly appreciated… would love to use it. Hi, just installed your widget and it works great. One question though, is there a way to edit the confirmation message? I am using a single confirmation and getting a few people who aren’t aware there’s an email that needs to be approved before they’re actually subscribed. Not currently, without editing the string in cm-ajax-widget.php or cm-ajax-shortcode.php. I’ll look at making this either filterable, or translatable so that you can make a local configuration without having to change it each time you upgrade. Great widget 🙂 I’m just having a problem with presentation of the web page that should be displayed after someone completes the subscribe form. I set up a link to the subscribe confirmation page in CM and with the normal CM subscribe function in a page the subscriber is redirected to the page after subscribing. Using your widget just gives the subscribe confirmation message but no automatic redirect to the confirmation page. Any ideas? The whole point of this widget is that it doesn’t redirect the user, just submits an AJAX request and handles it all from there. If you want to take users to the confirmation page, you should use the standard CM subscription forms. Yup, that makes sense – thanks for the quick reply 🙂 While I have your attention, can I ask on an unrelated issue, if it would be possible to change the submit button title to read something other than Register as it currently does and if so, where/how to do it? It’s in cm-ajax-shortcode.php and/or cm-ajax-widget.php. Excellent, all solved, many thanks. Not currently no. Creating the UI for adding form fields is quite a big job, so it’s unlikely to make it into this free version. My “WP e-Commerce / Campaign Monitor” plugin includes a filter so that you can add custom fields programatically, e.g. if you always want to add a fixed value, but not sure if that would meet your need? It does not check if the email address is already in the list. Is there an option you will add this in the future? I hadn’t planned on it – there’s no real need since re-adding someone isn’t an “error”, and should fail silently? Is there some other issue it’s causing you? this is the nice plug in ….. can we adjust pop-up massage on success & failed massages ? I’ve not used the WPMU plugin so don’t know exactly how it works. However, my plugin can show the form either as a widget, or as a shortcode (and also via template tag-like syntax, by using do_shortcode()). So there’s quite a lot of ways of generating the form. If none of the above work in the WPMU pop-up plugin then I’d ask them to provide support for either shortcodes, or publishing widgets into the popover, there’s nothing else I can do to make this happen, but seems like it would be sensible if their plugin supported shortcodes and/or widgets in the content. I do not seem to find a CSS and be able to style the plugin? You don’t need a separate CSS file – you can add any styles you want to your theme’s CSS file. Great Plugin. Is there anyway to make the name a required field? I’m keen to integrate CM into the WPEC checkout experience. Have you tried this / any thoughts? Currently the ‘fail’ message is wrapping my content. There’s no easy way to change the messages in the free version. In the "pro" version, all of the strings are translatable – so if you’re used to working with standard WordPress language files then you can just create a translation for the string you want to change. That said – the various outputs all have CSS IDs/Classes so you should be able to easily target them with CSS to change the layout. Awesome. Pro version it is! Much better! Squared those messages right away. and include a no-repeat scroll .png for the hover? I’m sure most people wind up doing something similar, but it’s sort of weird the plugin adopts the style.css hover style. At any rate, thanks again. Love the plugin. is not evaluating to true even though the request was successful. Any idead where the extra space could be coming from? No idea, could be anywhere in your theme, or one of the plugins you’re running. Maybe a failsafe jQuery.trim or indexOf can be added to the plugin, to make sure you catch this? I was getting this same issue. The fix for me was to modify to return 1 rather than use SUCCESS. This way I can then use a boolean if(data) in the ajax response. Love the plugin. Works great. Unfortunately I’m getting hit hard by spam. Is there any way of adding a captcha or similar? The Pro Version includes Honeypot spam protection which may well help depending on the exact spam you’re being hit with.